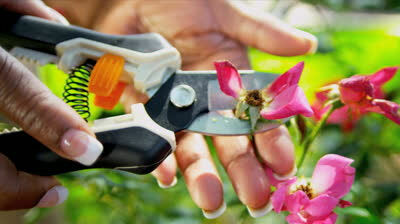 Pinch off dead blooms with your fingers or use pruning shears. 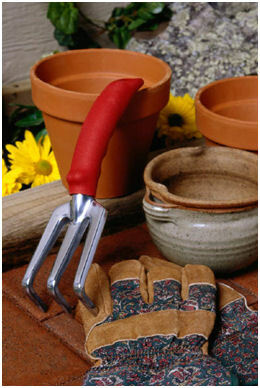 One area of container garden maintenance is grooming. Grooming is what keeps most annuals and a lot of perennials looking their best. It encourages repeating bloom times and increases the number of blooms a flower may produce. Grooming may be as simple as deadheading spent blooms, or it may involve cutting back or pruning plants. Many annuals and perennials will continue to bloom longer if you remove dried, withered blooms. This is called “deadheading” . All you need to do is pinch off the dead blooms with your fingers. 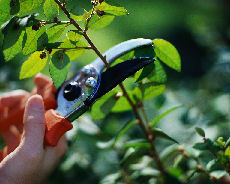 On tough flowers or woody stems, use pruning shears. Cut or pinch off the flower just above the leaf immediately below it. If a plant has small blossoms that are hard to deadhead individually, wait until most of the blossoms are ready to remove and then use garden shears and shear them all off. Many plants will bloom again in a couple of weeks by doing this. Grooming by shearing will also improve the plant’s overall appearance. Encourage repeat blooming by trimming off spent blooms. picking off dry leaves from geraniums, save them to use in potpourri. Container garden maintenance may involve cutting back. Some flowers may get too tall and look awkward in their container. Cut them back to encourage multiple blossoms and a more compact growth. You may also want to turn your containers around from time to time so that each side of the container gets enough sun. Plants start to look straggly if they have to reach too much for sunlight. branches from this point. If flowers appear, pinch them off too. When the plants and large and full, you can cut large quantities of herbs for use, drying or freezing. In general, trim off old growth, stems and leaves. Many times this encourages new growth. If you think a plant is through blooming, check at the base of the plant for new growth. If you wait a little while, you may be surprised to find that it will bloom again. Cut away dead or diseased stems or branches. Pruning is a necessary chore for proper container garden maintenance. Pruning is needed when caring for container gardens that include larger plants. It promotes the health of plants and improves their shape. Cut away dead, damaged or diseased growth. Remove excess branches too. This will allow more air to circulate among the plants and allow sunlight to reach them all. When shaping a shrub or tree by pruning, cut back branches at varying lengths for a more natural look. Make the cuts at branch unions or just above buds. Grooming a shrub or tree by thinning helps promote flowering but does not change the shape. This involves removing whole branches. When cutting off a branch, don’t leave a stub of branch sticking out from the main stem or trunk. This invites disease. should be pruned after spring blooming. Remember, in general, cutting the main and secondary stems will generate more growth and often second and third sets of buds and blooms. Don’t prune in the hottest part of the day. When planning your container garden maintenance, remember that early spring is generally the best time to prune deciduous plants. You can see the branch structure and cuts will have time to heal before winter. Prune fast-growing plants at any time in the season, but not during the hottest part of the day. As your plants grow, repotting to a larger container becomes a must. Container garden maintenance will require replanting from time to time. Keeping containers looking their best may mean replanting. This is another beauty of container gardening. When a flower has finished its bloom time or when a plant wilts or for some reason dies, we can just pull it out and plant something else. This can be done for seasonal change too. Replace geraniums or petunias with African daisies, spurge or flax for fall. Add asters or chrysanthemums too. Keep the container full all season. Replanting may also be necessary if a large perennial, shrub or tree has outgrown its pot or box. Repotting in a new pot 2 to 2 ½ times the size of the outgrown one will keep you from having to do this too often. When replanting, trim the plant’s larger roots back by as much as one-third and make sure the roots aren’t circling around the ball. 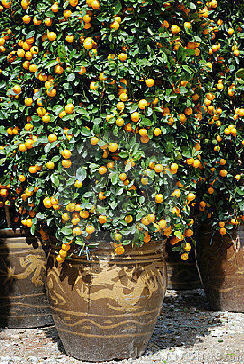 If so, loosen the ball and repot in a planter that is several inches larger. Use fresh potting mix and add fertilizer. At the end of the summer, bring your potted geraniums inside to keep as houseplants over the winter. Cut them back to about half their size and they will send out new shoots. In spring, after threat of frost, you can move them back outdoors. them. If you live in an area where temperatures dip below freezing, overwintering is a must. There are several methods to use to overwinter – learn about them and which will work best for you. and clean them so they’ll be ready for the following spring. infested plants at any time, dip the pot in a weak solution of bleach and water and allow it to air dry. Winter time is a good time to spruce up your pots and containers too. Maybe you have plain containers that you want to paint or you have pots that are chipped and need touched up. Just remember that painting doesn’t mean water proofing. If you paint your containers, wait until the paint has thoroughly dried and then add a couple coats of polyurethane to weatherproof. Make an inexpensive container look nicer with some spray paint. There are all sorts that have a texture. They will make plastic look more like stone or concrete. Once dry, protect the finish with a coat of exterior polyurethane. One can of paint will do several containers. Container garden maintenance means controlling pests and diseases in your boxes or pots. Just like other gardeners, container gardeners have to deal with the invasion of pests in container gardens and also disease in container gardens. The good thing is, because we water often and our plants are nearby, we can often find insects problems or disease early and have the opportunity to treat problems before they become huge infestations.